The Gap of Dunloe Ireland might not be as famous as nearby attractions, like the Ring of Kerry or the Cliffs of Moher. After all, it’s just an 11km stretch of winding road through the countryside, right? It is a “just” a stretch of road but it also happens to be the most breathtaking stretch of road I can ever remember seeing. 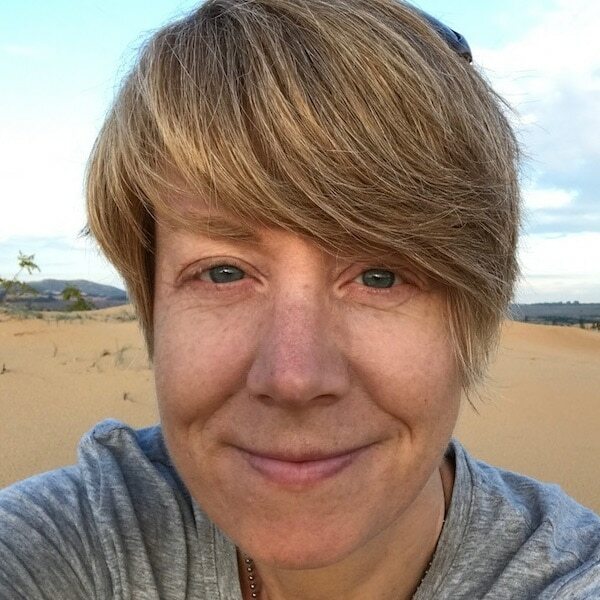 And I have seen a few breathtaking stretches of road in my time, like the mountain pass over the Tatras in Slovakia, or the road that winds its way up into the Qinling Mountains in China, and the road over the Annamite mountains in Vietnam. What’s so Great About the Gap of Dunloe? The single lane of tarmac winds its way along the route of the river Loe. 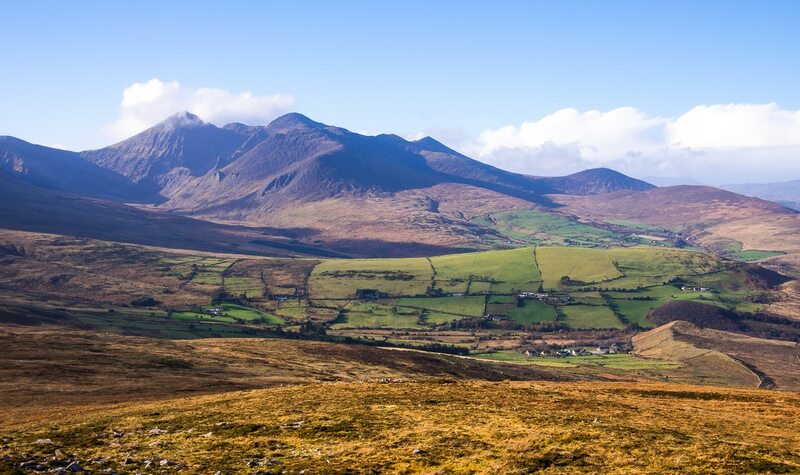 On one side looms the imposing Macgillycuddy’s Reeks, a mountain range which includes the highest peak in Ireland, Carrauntoohil. 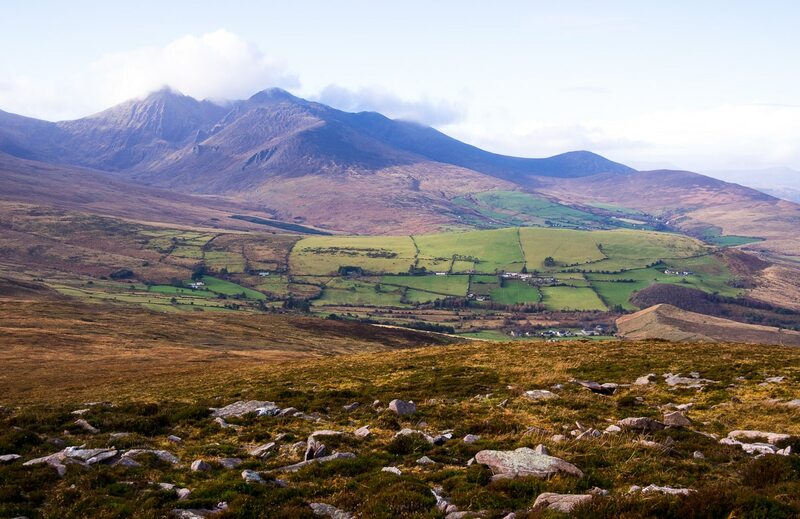 On the other side is the rolling Purple Mountain which forms the western border of Killarney National Park. 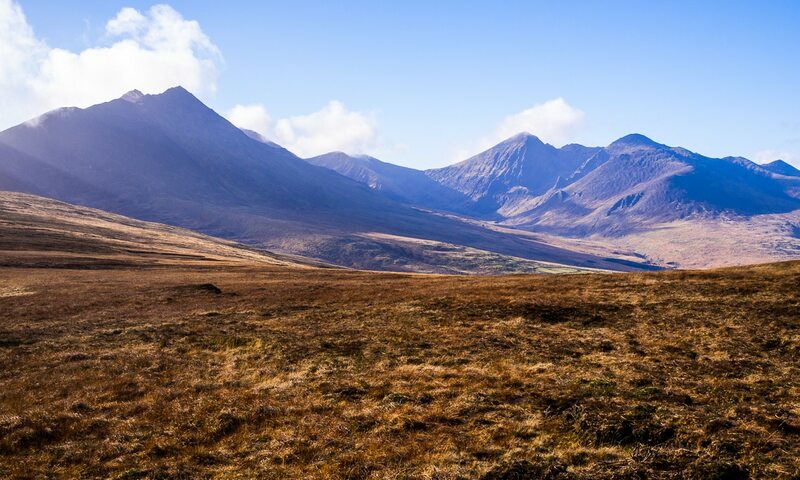 The gorgeous Macgillycuddy’s Reeks loom large over the Gap of Dunloe. The road writhes up and down, left and right, and with every twist and turn a new stunning view is revealed. Most people make the trip by bicycle, walking, or on a horse-drawn trap, driven by colourful locals who are sure to share stories and local legends as you drive. In summer the road is closed to private cars. But if you arrive during off season, you can drive the route, just like I did. Just make sure to keep your eyes on the road and off the gorgeous scenery! On my visit, one sunny morning in early January, I had to stop the car every few hundred metres, just to take in the awesome sights without running off the road. Luckily, I had the road to myself — not a single car came or went while I was making my traverse. Related: If you’re looking for other great Irish destinations, here are about 60 more amazing Irish destinations recommended by other travel bloggers. If you’re heading to Northern Ireland, this Game of Thrones tour and don’t miss seeing the Giant’s Causeway! 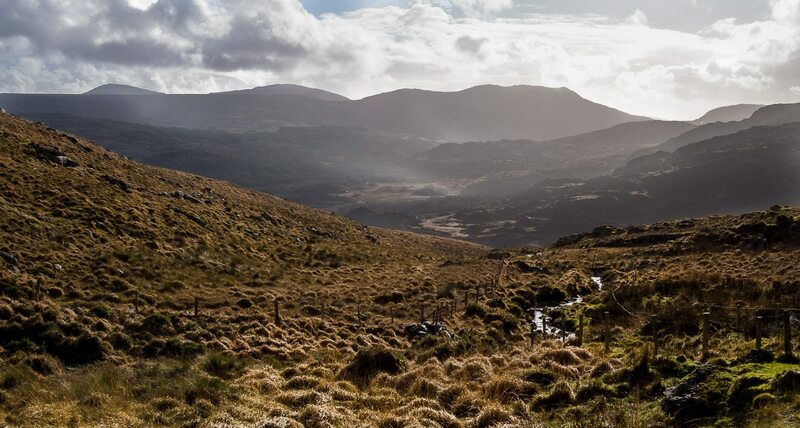 A short walk from Kate Kearney’s Cottage, you can make the climb up the trail on Kerry Mountain. It’s a relatively easy hike, but be aware that the weather can change quickly! Be prepared for colder temperatures, a slippery hike, and outstanding views like these. The silver twist of road winds its way through the Gap of Dunloe. 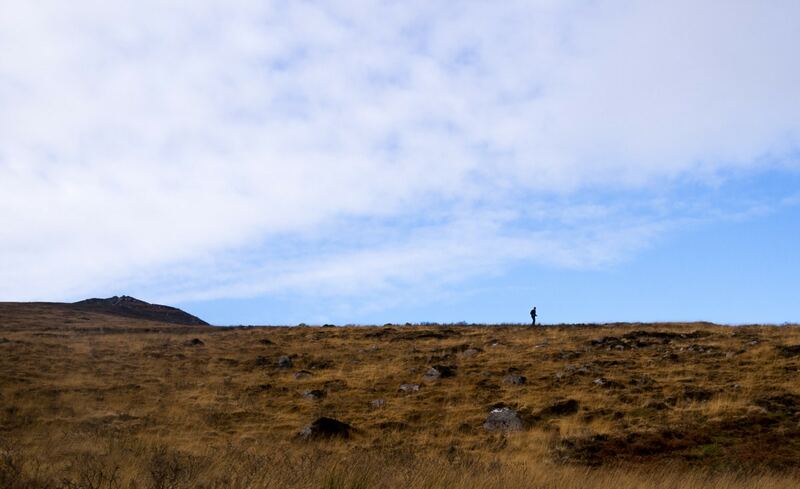 A lone hiker strolls through the hills above the Gap of Dunloe. 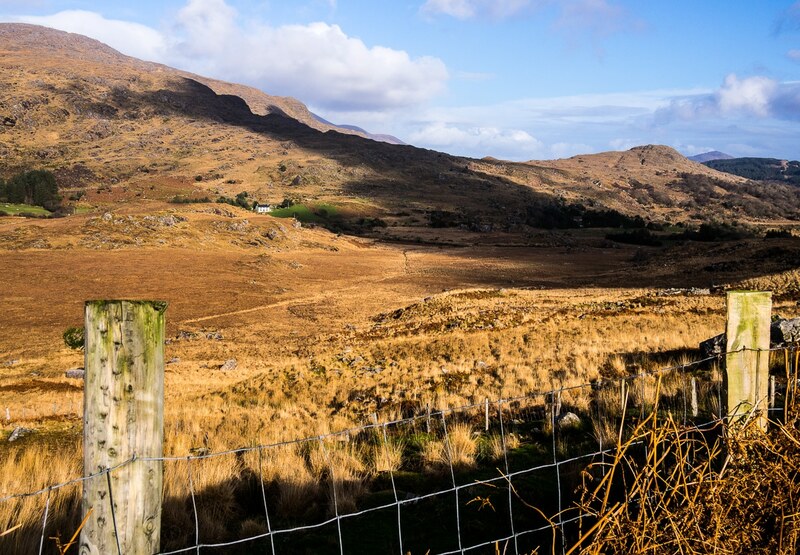 The multi-layered landscapes you will see on a hike above the Gap of Dunloe are stunning. That’s me, with rosy cheeks and a heart full of awe at Gap of Dunloe. Green fields just starting to grow on the approach to the Gap of Dunloe. A stunning view over the mountains above Gap of Dunloe. 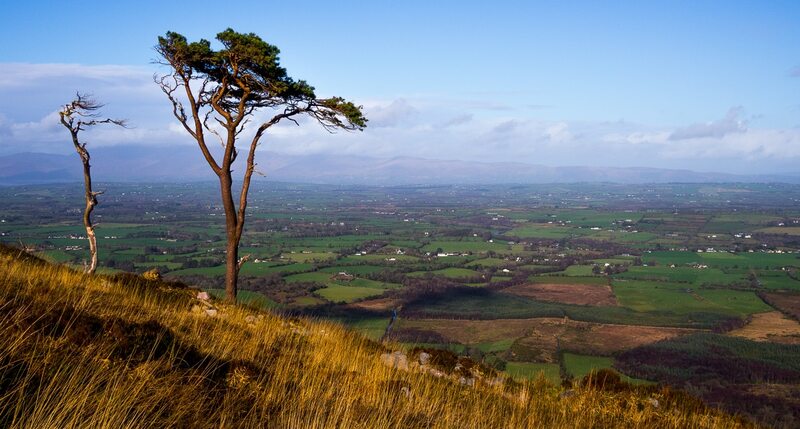 A lone tree looks out over Killarney from the hills above the Gap of Dunloe. After a climb in the hills, take your car (if it’s low season), or bike, walk, or ride a pony trap into the valley. I loved the twists and turns of the narrow road as it snaked its way through ever-changing scenery. The wonderful Black Lake at the Gap of Dunloe Killarney. A stone bridge spans the river Loe at the Gap of Dunloe. 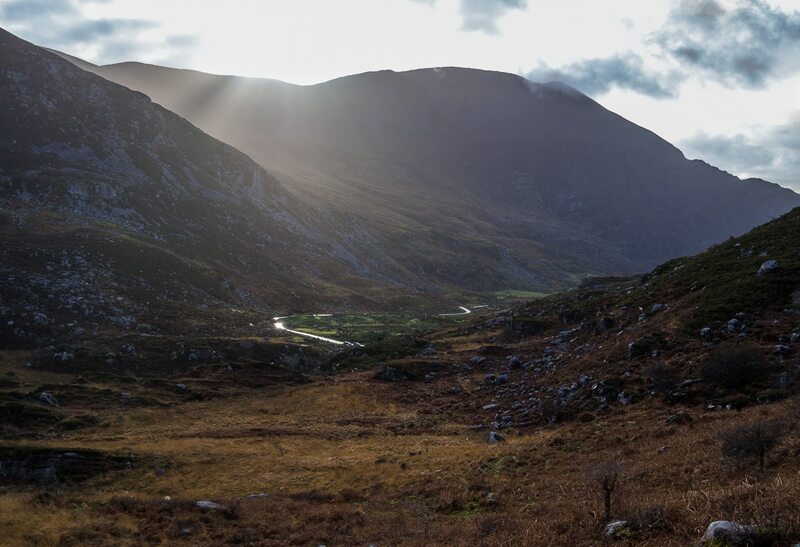 View from the road approaching Molls Gap, near the end of the Gap of Dunloe. 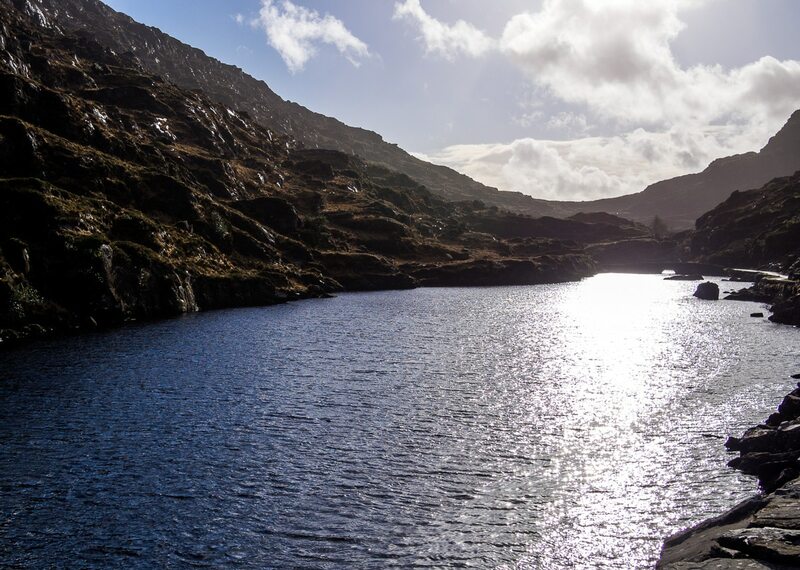 In high season, take the shuttle bus from Killarney to Gap of Dunloe. It will drop you at Kate Kearney’s Cottage, a bar and restaurant, and also the usual starting point for any day exploring Gap of Dunloe. If you’re going in low season, you’ll need to find other transportation, since the shuttle busses don’t run. As with most of the sights in western Ireland, if you’re visiting in low season, the best way to get around is to rent a car. Car rental in Ireland is inexpensive but petrol costs are high — I spent far more on fuel than on my week-long rental! There is a parking lot at Kate Kearney’s Cottage, so you can leave the car and set out on foot. Also, Kate Kearney’s may well be closed, depending when you visit, so bring your own pack lunch from Killarney. Pony trap drivers will likely be on sight to offer you a lift no matter what time of year you go. 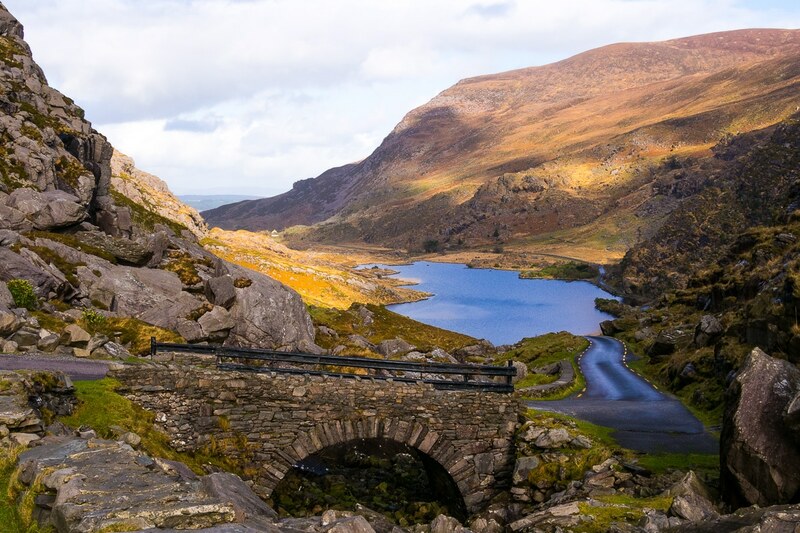 In high season, from about May to October, the Gap of Dunloe can be a touristy nightmare, where the hassle and the crowds will sap all pleasure from the stunning scenery. If you’re in Ireland in summer, you might just want to skip it. Note that private cars aren’t allowed between Kate Kearney’s Cottage and Lord Brandon’s Cottage during the busy months. However, in off-season, if you manage to score a sunny day, you’ll have the place to yourself. On my visit, I bumped into two or three locals who were hiking the trails around the gap and that was it! The best time to go is on a mild day in early spring, after the worst winter chill has faded but before the tourists flood in. Then you can take advantage of the solitude to feast your eyes on the landscape. To do the classic Gap of Dunloe Tour, start at Kate Kearney’s Cottage and hop onto a horse drawn trap for a slow and scenic visit. You can also do the Gap of Dunloe walk, or cycle the 11km road which ends at Lord Brandon’s cottage, a tea room and cafe. From there, hop on a boat through Killarney National Park, ending at Ross Castle where the shuttle bus will take you back to Killarney. You can also pre-arrange a private tour to the Gap of Dunloe. Here are some other Killarney tours you might want to try. I can’t say enough wonderful things about the Black Sheep Hostel in Killarney. It has a fabulous shared kitchen, extremely comfortable beds with privacy curtains, lockers, and personal lights and power plugs, plus a roaring fire in the lounge every evening. Stay at the Black Sheep or, if you’re not a hostel person, try these Killarney hotels on for size. Please PIN if you want to go! Just a little note to let you know that if you book a tour or a hotel using any of the links above, you’ll be supporting this blog at no extra cost to you. We appreciate it so much! Excellent photos!!!! Cathy and I were there in June 2014, one of the many beautiful places throughout Ireland. We had rented a car for 2 weeks and spent 4 days cruising throughout Kerry, it was mesmerizing!!! Thanks Larry. It really is a beautiful corner of the world! Beautiful pictures!! Really a must visit based on your experience and photos. Never been to Ireland but really would love to soon! Ireland is just full of beauty and the people are unbelievably friendly too. Really wonderful place to visit, especially if you’re into the outdoors and historical attractions. The Gap of Dunloe looks like a travel and landscape photographer’s dream. I love the sweeping views, the moorland and the lone trees. So many compositions. It really is. I’m only an OK photographer but I have seen pro photos that will absolutely blow you away! Now that is a stunning 11km of winding road. I can see why you had to stop so often to avoid running off the road! Great tip about going in the off season so you can drive it in full. My pictures really don’t capture just how hilly and winding it was! So glad there were no cars coming the other way or I don’t know what I’d have done. You weren’t kidding! Those photos gave me Gap of Dunloe wanderlust for sure! I love the look of the Black Lake, and I always love to visit natural wonders that aren’t as overcrowded. You feel like you’ve stumbled upon something special. Thanks for sharing! Thanks Paige! I definitely felt like I had stumbled upon something so special, especially since many of the reviews I’d read said the Gap of Dunloe wasn’t a must-see. For me, it was far more striking than even the Cliffs of Moher! You’re right – I haven’t heard of the Gap of Dunloe before, despite thinking I’m on top of most Irish attractions. Definitely the most beautiful stretch of road I’ve ever seen! 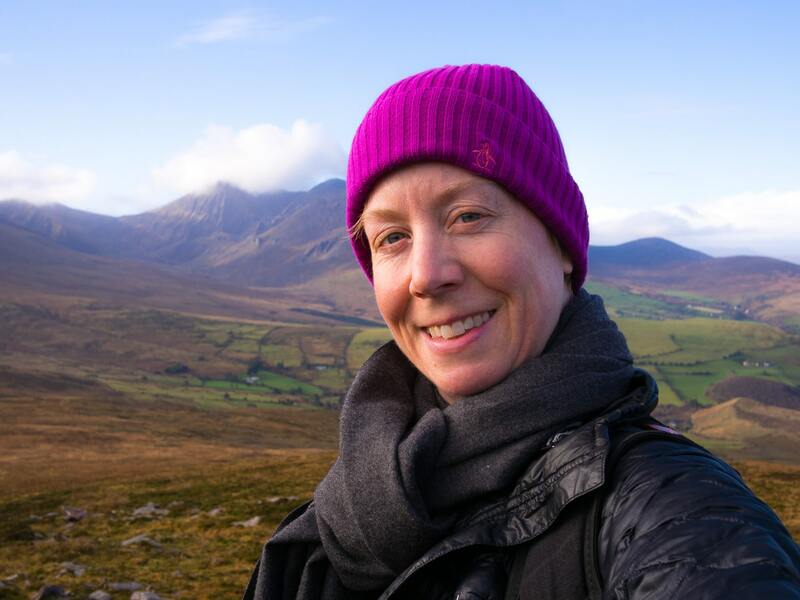 Love the ever changing scenery – thanks for the tip on climbing up the trail on Kerry Mountain – I love that there are so many opportunities to stop and take a short hike. The stone bridge that spans the river Loe is particularily scenic. So beautiful. Thanks for highlighting this road! Ok, your pictures sold me, gorgeous. Would be great to go during off season, so thanks for the tips on how to get around. That way we have the place all to ourselves! So cool that you were able to drive a road that’s usually closed to private cars and able to avoid the tourist crowds. I’m a big fan of traveling in off season. Haven’t been to Ireland yet but it looks wonderful. Yes, I was very lucky. I had no idea it was closed to private cars until I researched later on :). It was a fun drive but a bit of a thrill ride at times, since you really can’t see what’s coming over the hill / around the corner. Not for shy or inexperienced drivers! YES. We’ve been steadily building a bucket list for an early spring trip to Ireland, and this is now on the list. Beautiful shots! Can’t wait to get back in front of awe-inspiring landscapes like that again :) Thank you so much for sharing! Perfect. I think early spring in Ireland is a perfect time to go. Of course you have to be prepared for lots of rain (just in case) and you’ll find a lot of things, especially public transport, are closed for the off season. Ideally, renting a car at that time of year makes the most sense. We lived in Cork for a year when our kids were really small. I would love to go back because I didn’t get to see much of the country side. I am saving this for when that day comes! The photos are beautiful and I am sure don’t do it justice as I know Ireland is so beautiful! Ireland just has endless places to visit, for sure! And no, my pictures don’t nearly do it justice!! 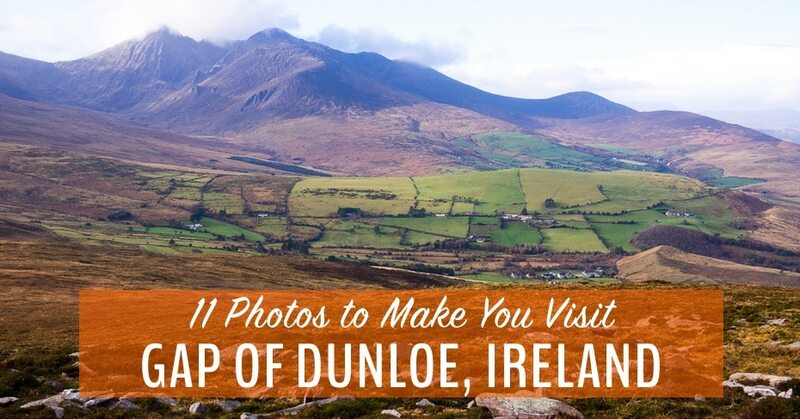 Check out this extra long post with 60 of the best places to see in Ireland. 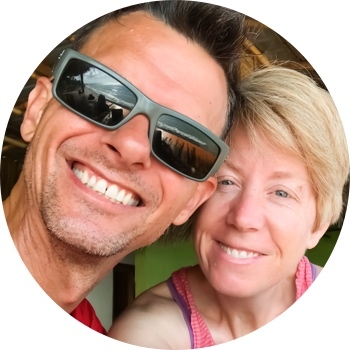 It’s all by travel bloggers (we’re featured in it). 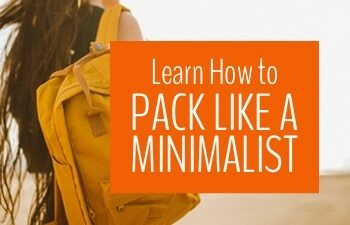 Will give you lots of inspiration! Off season is a huge gamble in Ireland as you’re much more likely to get buckets of rain than a sunny warm day. But if you’re lucky like I was, it’s spectacular!